the charlie chaplin. the earth is to his right. it is 2 feet above the marble ground. 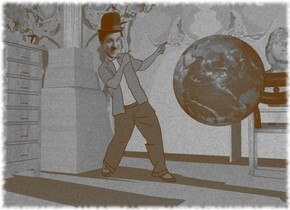 the large [pattern] wall is 9 feet behind charlie chaplin. the marble column is behind and 1 foot to the left of charlie chaplin. the marble desk is in front of the wall. it is to the right of Charlie Chaplin. the marble chair is in front of the desk. it is facing the desk. the marble dresser is 1 foot in front of the column. it is facing right. the large marble bust is on the desk.